Professor Sir Martin Evans, Nobel Prizewinner for Medicine 2007 and former UCL student and staff member, lectured at UCL on 6 October. Professor Evans received the Nobel Prize for a series of groundbreaking discoveries concerning embryonic stem cells and DNA recombination in mammals. He gave the 2009 Clinical Prize Lecture on the subject of 'Stem Cells: Past, Present & Future'. The lecture was introduced by Professor Anthony Segal (UCL Centre for Molecular Medicine) and attended by UCL President and Provost Professor Malcolm Grant, to a full house in the UCL Cruciform Building. Professor Sir Martin Evans took his PhD at UCL under Elizabeth Deuchar on the genetic control of vertebrate development, before going on to teach at the former Department of UCL Anatomy and Developmental Biology, where he conducted pioneering studies in mouse cell culture. This work paved the way for his discovery of embryonic stem cells at the Department of Genetics at Cambridge. 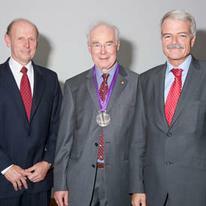 The annual UCL Prize Lecture in Clinical Science has been running for 12 years. Within this short space of time it has become the pre-eminent series on contemporary science in Europe. The event provides an opportunity to debate and celebrate important scientific advancements. To watch the lecture in full, follow the link at the top of this article.